The 911 Carrera T is based on the standard 911 Carrera, but with major changes. While the T stands for Touring in Porsche speak this is not a GT (grand touring) vehicle in the conventional manner rather the T is aimed at harder performance through lower weight. 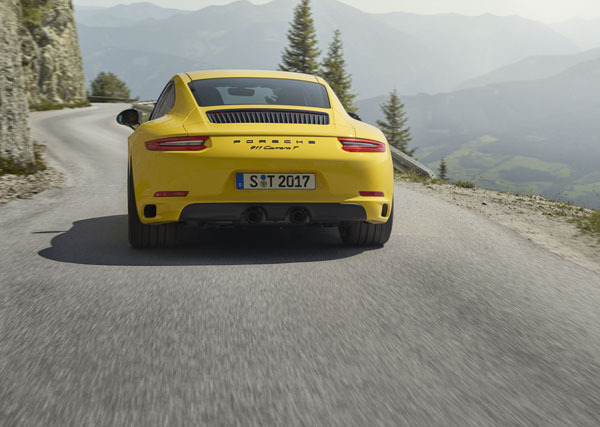 To trim mass the Porsche Carrera T rear window and rear-side windows are made from lighter glass and the door trims feature opening pull loops instead of handles. Noise suppression materials are minimal and there are no back seats. The PASM (Porsche Active Suspension Management) system is standard and works on a 20 mm lower ride height, optimised Sport Chrono Package, a shortened shift throw with red shift pattern and Sport-Tex seat centres, the headrests feature a “911” logo stitched in black. Full bucket seats are available as an option. You can choose to order it without the PSM (Porsche Communication Management) system. Carrera T features an aerodynamically optimised front lip spoiler and rides on 20-inch Carrera S wheels in Titan Grey. The rear is characterised by vertical slats in the rear lid grille. The 3.0-litre, six-cylinder engine with twin turbochargers generates 272 kW (370 hp) of power, and 450 Nm of torque between 1750 and 5000 rpm. The power-to-weight ratio improves to 3.85 kg/hp. 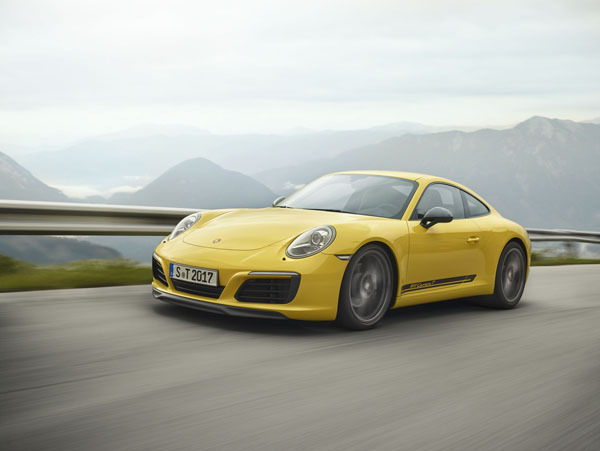 The shorter gear ratios in the seven-speed manual gearbox combine with the mechanical differential lock to let the 911 Carrera T get from zero to 100 km/h in 4.5 seconds, which is 0.1 seconds faster than the 911 Carrera Coupe, on its way to 200 km/h in just 15.1 seconds. Porsche DoppelKupplung (PDK) is available as an option and brings the 100 km/h sprint in 4.2 seconds, and 200 km/h in 14.5 seconds. Both transmission variants allow a 290 km/h top speed. The 911 Carrera T is priced from $238,400 in Australia with local deliveries expected to begin in the second quarter of 2018.